Mali opposition not united for runoff presidential vote - SABC News - Breaking news, special reports, world, business, sport coverage of all South African current events. Africa's news leader. Opposition candidates who fell short in Mali’s presidential election have refused to back either of the frontrunners who will contest a runoff vote on Sunday. 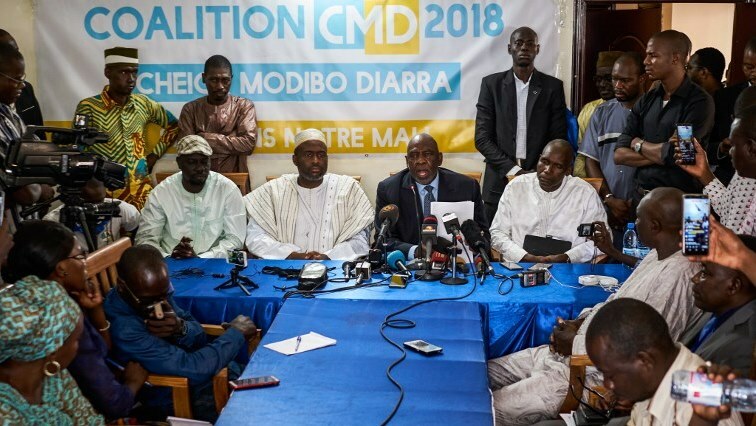 Two of the losing candidates, businessman Aliou Boubacar Diallo and former prime minister Cheick Modibo Diarra, who came in third and fourth place respectively, said on Thursday they would not rally behind anyone. The second round vote will see a rerun of the 2013 election between President Ibrahim Boubacar Keita — widely known as IBK — and opposition hopeful Soumaila Cisse. Cisse had called for a broad opposition coalition as he prepares to take on the incumbent, but that now appears to be off the table. “Neither matches our ideals. Replacing Ibrahim Boubacar Keita with Soumaila Cisse is not a change,” Diarra, who won seven percent of the July 29 first-round vote, told reporters Thursday. A few minutes later, Diallo said he “could not do more than to invite Malians to think about their future,” without suggesting a preferred second-round candidate. Mali’s Constitutional Court on Wednesday rejected a legal challenge to the first round of voting in the presidential election, confirming August 12 as the date for the runoff. Keita, 73, was credited with 41.7 percent of the vote while Cisse picked up 17.78 percent. With no voting instructions from the main opposition candidates, President Keita is seen as clear favourite to win Sunday’s vote. But mounting accusations of fraud and ballot box stuffing marred the days following the poll. Last week, Cisse urged the 22 candidates eliminated in the first round to create a “broad democratic front against fraud and for political change,” adding he believed that a majority of people backed change. Violence disrupted polling in several areas beset by ethnic and jihadist unrest despite the deployment of 30,000 security personnel for the vote. Cisse said the official outcome was a travesty and urged beaten rivals to swing behind him. The government on Monday published a list of 871 polling stations which were unable to operate during the first round due to outbreaks of violence. Almost a quarter of a million people — mainly in northern Timbuktu region, central Mopti and Segou in the south — “were unable to vote for various reasons,” it said. The only female candidate, Djeneba N’Diaye, said that her 11,600-strong support, equivalent to a 0.36 percent vote share, would now plump for Keita. Mali is a linchpin state in the Sahel, a sprawling, poor region that has been wracked by jihadism, ethnic attacks and crime. The international community is hoping the outcome of the poll will strengthen a 2015 peace accord. Teams from the European Union, the African Union, the regional ECOWAS grouping and the Francophonie organisation sent observers to the poll. This entry was posted on 09 Aug 2018,06:33PM at 6:33 PM and is filed under Africa, News, Homepage Latest Stories Slider. You can follow any responses to this entry through the RSS 2.0 feed. Both comments and pings are currently closed.